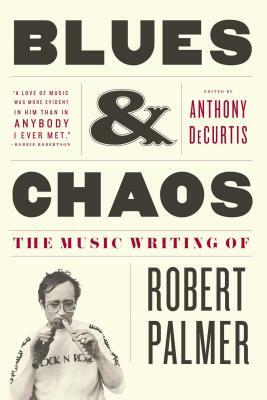 Now in paperback, the definitive anthology from a writer who “set the standard for newspaper pop-music criticism” (The Philadelphia Inquirer), the New York Times’ first chief pop music critic and Rolling Stone contributor Robert Palmer. Robert Palmer’s extraordinary knowledge and boundless love of music were evident in all his writing. He was an authority on rock & roll, blues, jazz, punk, avant-garde, and world music—often discovering new artists and trends years (even decades) before they hit the mainstream. Noted music writer Anthony DeCurtis has compiled the best pieces from Palmer’s oeuvre and presents them here, in one compelling volume. A member of the elite group of the defining rock critics who emerged in the 1960s and 1970s, Palmer possessed a vision so complete that, as DeCurtis writes, “it’s almost as if, if you read Bob, you didn’t need to read anyone else.” Blues & Chaos features some of his most memorable pieces about John Lennon, Led Zeppelin, Moroccan trance music, Miles Davis, Jerry Lee Lewis, Philip Glass, and Muddy Waters. Wonderfully entertaining, infused with passion, and deeply inspiring, Blues & Chaos is a must for music fans everywhere. Robert Palmer was born in Little Rock, Arkansas in 1945, and graduated from the University of Arkansas at Little Rock in 1964. He began writing for Rolling Stone in the early '70s -- and continued to do so as a contributing editor throughout his life. From 1981 until 1988, he was the chief pop music critic at The New York Times, the first person to hold that title, and he continued to write for the Times after that. He is the author of Deep Blues: A Musical and Cultural History of the Mississippi Delta (1981); Baby That Was Rock and Roll: The Legendary Leiber and Stoller (1978); A Tale of Two Cities: Memphis Rock and New Orleans Roll (1979); Jerry Lee Lewis Rocks! (1981); The Rolling Stones (1983); and Rock & Roll: An Unruly History (1995). He wrote liner notes for dozens of releases, and his work appeared in virtually every music magazine published during his time, including Downbeat, Crawdaddy, Guitar World, and Musician. Palmer died in 1997. Anthony DeCurtis is a contributing editor at Rolling Stone, where his work has appeared since 1980. He has written for numerable music and entertainment magazines and newspapers. A former on-air correspondent and editorial director at VH1, he has contributed to a myriad of television specials and programs. DeCurtis holds a Ph.D. in American literature from Indiana University and he teaches at the University of Pennsylvania and the Gradudate School of Journalism at the City University of New York.